Today I am going to tell you about a teaching job which has been announced at Hazara University. The Hazara University is a Public Sector University, Chartered by the Government of Khyber Pakhtunkhwa. The university offers the following positions on a regular basis. 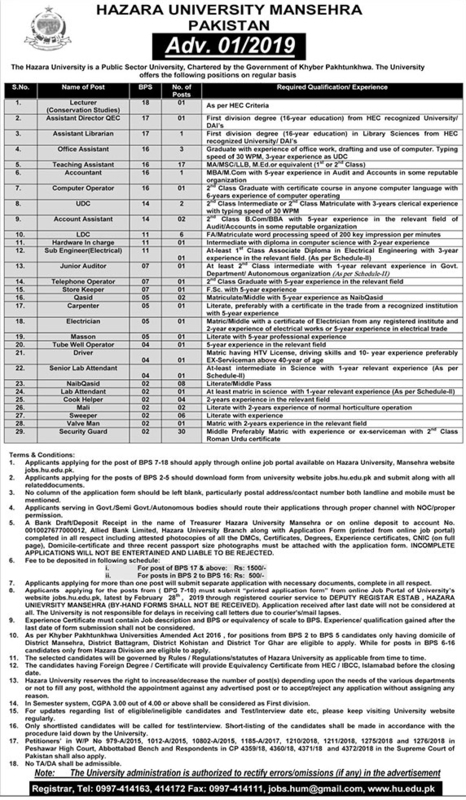 Hazara university jobs 2019 for Lecturer, Assistant Director, Assistant Librarian, Office Assistant, Teaching Assistant, Computer Operator, Upper Division Clerk UDC, Sub Engineer, Junior Auditor, Telephone Operator, Naib Qasid, Lab Attendant, Security Guard, Carpenter. The Khyber Pakhtunkhwa government has announced several jobs in Hazarah University in which people from across Khyber Pakhtunkhwa can apply. Both men and women can apply to the Hazara university's job. You should have a master degree in order to apply for this job. More than 100 jobs have been declared in the Hazara University by the Khyber Pakhtunkhwa government. Only shortlisted candidates will be called for test/interview short-listing of the candidates shall be made in accordance with the procedure laid down by the University. 16-years education in Library sciences, MA, MSC, LLB, MBA, B.com, BA, BSc, BBA, FA, Matric, from HEC recognized university with 2nd class. How to Apply for Hazara University Mansehra job 2019? Applications applying for the post of BPS 7 t0 18 should apply through online job portal available on Hazara University, Mansehra website jobs.hu.edu.pk. The last date of application is not yet.